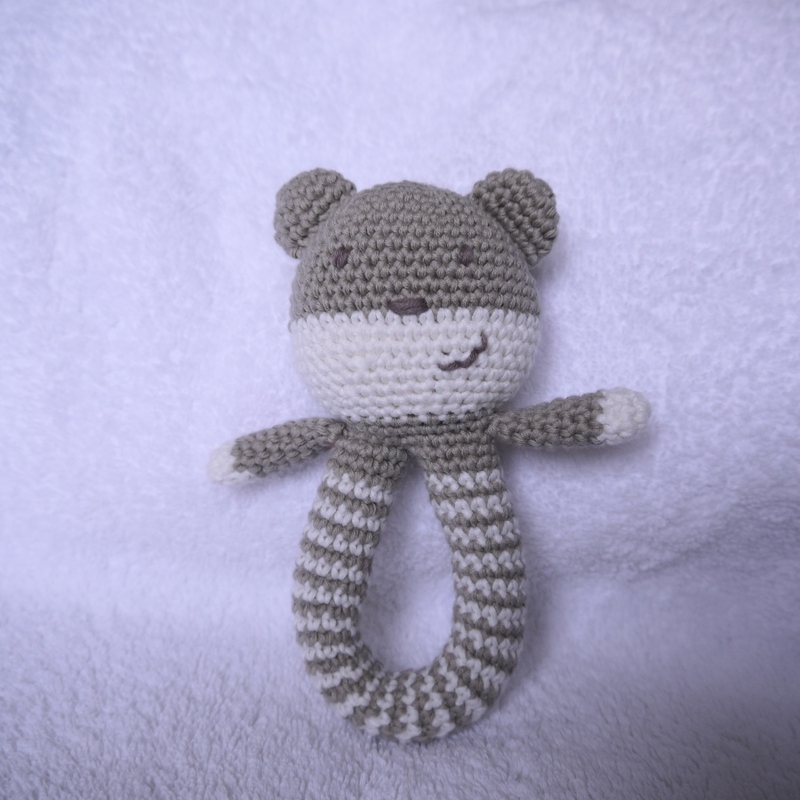 Thank you so much for your interest in my little teddy rattle. Here, at last, is the pattern. As usual, please do not sell this pattern. Do not post this pattern to any website, but link directly to my blog. No file sharing of this pattern. Please respect my rights as the designer of this pattern, so that I can keep on sharing my patterns for free. For this photo, I stuffed the cotton "bag" before putting it in the head. 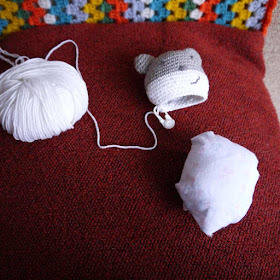 It's easier to place the empty "bag" in the head before adding the rattle and stuffing it, and then sew the gap closed. Another solution would be to user a smaller hook, so that your stitches are really very tight. I prefer to line. For now, though, let's get on with the actual pattern. rnd 6 - working through both thicknesses, 4 sc. Fasten off, leaving a long tail to sew the ears to the head. Can you see the larger stitches? Join in one of the arms by crocheting through both thicknesses together with the rest of rnd 23. Continue sc until you are at the centre front of the head, then skip 12 sts and sc in the next st. From now on, you will be working only in the remaining 12 sts. Work several rows in colour A, and then add colour B and work in a spiral, changing colour every 12 sts (leaving the yarn to one side every time you change colour - don't cut the yarn!) If you prefer, you can also make the handle in a single colour. Here you can see how the handle is constructed. Continue the tube, stuffing as you go. As this part is too narrow to line, I use a very old woollen felted blanket, cut into little shreds, to stuff the handle. Continue until the handle measures approx 19 cm (7 1/2 inches), finishing with colour A, and work the same number of rounds in colour as you did at the beginning of the handle. Join in the second arm, on the same side as the first one (see photo). Finish off the rnd on the opposite side to the arm and finish off, leaving a long thread for sewing. Now make sure you have stuffed the handle enough, then very carefully sew the open part of the handle to the remaining 12 sts of the head. Don't hesitate pulling on it to make sure your stitches are strong enough. Safety is an issue here! When you're satisfied that the handle is securely sewn, fasten off and hide the ends inside the head. And there you have a cute little teddy rattle! Perfect for my new great nephew, thank you! Can I please translate it to Danish as I know that a lot of people will love it here ind Denmark - I can send it to you, so that you can offer the Danish pattern here as well? Gracias por tu patrón. Es adorable!!!!!! I will make sure to link and give you loads of credit! Thank you so much for the pattern, it is looking great. So sad I don´t have little babies around at the moment! That is an adorable pattern. I have bookmarked it for future use. It would be a fantastic shower gift. Can I sell finished toys made from your pattern? Yes you can but if possible please credit me as the designer. Hello, what a gorgeous little baby toy! Where do you find a rattle insert? If you're in Australia or the US they're easy to find, just google rattle insert. Some people also sell them on Etsy. If you're in Europe, contact me by email (see my profile page) and I might be able to help. Today my little yellow och white teddy rattle moved in with a little 4 week old baby :) Thank you so much for the really cute pattern! How lovely. It's a pleasure, I'm glad you like the pattern. Thank you so much for the wonderful pattern. Absolutely adorable! Another way to avoid the lining is a trick I use. I cut older t-shirts into strips 3/4 to 1 " wide and use it as stuffing. You can buy them at most thrift stores by the pound! I'm sure your little boy will love it! Hello :) I just want to say that I used this pattern and had no problem making it. Thank you! I've uploaded a photo of it + a link back to this page on my blog. I love it! And the colours you chose are great. I really thank you for this lovely pattern! I just finished it for my baby boy coming on 6weeks by now :-) Sure he'll love it! Your teddy looks belissimo! I'm sure your baby will love it. I love this bear! I'm half way through with one in offwhite and green for one of my friend's newborn son. That's great, Jenny. I'd love to see a photo of the finished rattle. Maybe you could add a link here or send me a pic by email? Where do you purchase a rattle insert? Great pattern. I can't wait to try it. Hi Terry, you can sometimes find rattle inserts in craft shops, or on ebay or etsy. I bought mine from a craft catalogue. If you're in Europe, let me know if you can't find one and I'll see what I can do. Hi, thank you so much for sharing this pattern, I've made it! Aww he's so cute! Thank you for sharing your photo. Hi Tamra, I know of at least one seller on Etsy who is based in the US and sells a pack of three rattle inserts for 2.50$. Hi, I just made this and I found a rattle insert in a rattle from the dollar store. It was only $1.00 and I cut open the rattle and took the little ball/rattle out to use in this! I've seen in previuos comments that some people have translated the pattern to Danish, and I was wondering if you allowed me to traslate it to Spanish. Thank you again for you being so generous! It's a pleasure, Sonia. May I share your page and your lovely photos on the Is it a toy Facebook page? So cute! And a good idea for the rattle, too. Most people have the odd white sock laying around. Use the toe part for lining the head for stuffing. This works very well. That's a great idea. I sometimes use the toe from a pair of tights or sheer socks too. So nice to do! Thank you for your generosity, the rattle was a big success! I'm so pleased you liked making it! Hello, you are so talented. I'm so gonna try doing this for my new born. 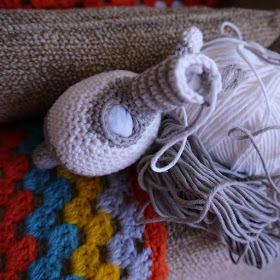 By the way, where can i buy rattle online? I'm from Malaysia (Asia Pacific). Trying searching it from the local craft stores, they don't sell rattle, perhaps I would substitute it with bells? Hi Bee Ling, if you go to etsy.com and search for "rattle insert" you'll find a few sellers. At least one of them is from Australia, so not too far from you. If you do decide to use bells, I suggest you enclose them in a little cloth bag so that the stuffing doesn't get inside the bell and stop it from ringing. Hi im not an experienced crocheter so i dont understand what do u mean by work through both thicknesses also for the ears r u working in rounds? 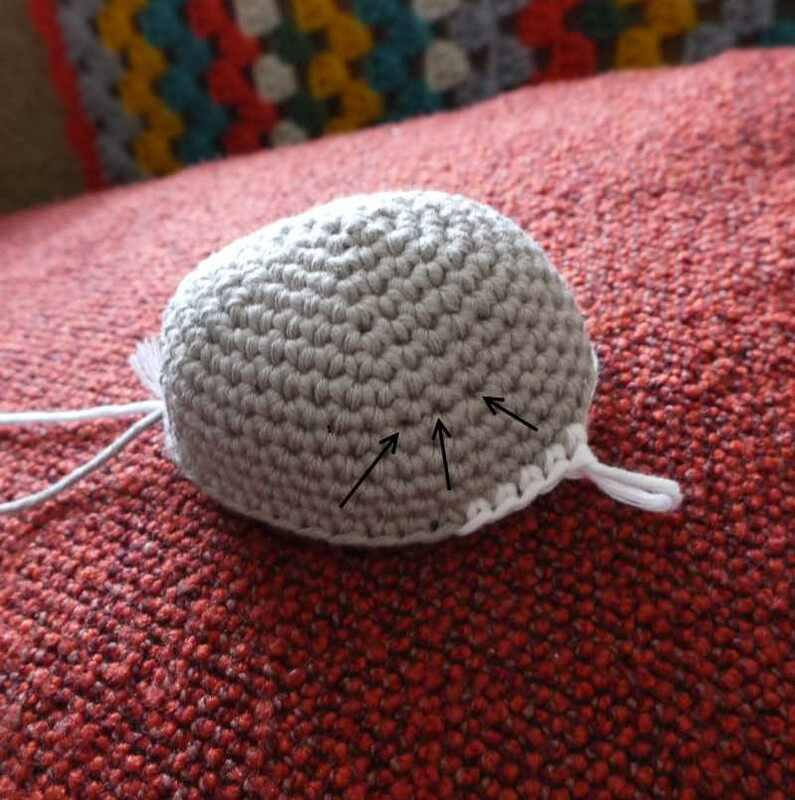 Hi for the ears you work in rounds, and then press the two sides together and crochet into two stitches at a time (one side pressed against the other) Gosh that sounds complicated but it really isn't! 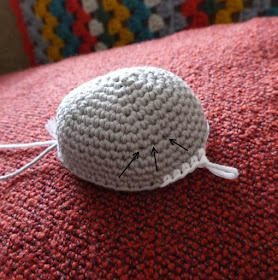 If you prefer, you can just sew the two sides together while you connect them to the head. I sometimes do it that way too. Thanks for this beautiful pattern! I 've make this teddy rattle. Pleas can I translate this pattern to Dutch? Hi, yes you can translate the pattern to Dutch but please also make a link back to this page and make it clear that I'm the designer of the pattern. Thank you. Great pattern! Could you post a picture, or explain in a little more detail, how you stitched the end of the tube to the body? I want the stitches to blend in with the crochet, but I also want it to be secure. Thank you! Normally, the number of stitches at the end of the tube should be equal to the number of stitches remaining at the head end. So you should just be able to sew one stitch to one stitch and then make sure you fasten off securely. I hope it works out! Thank you for this pattern. Really cure. Hi! 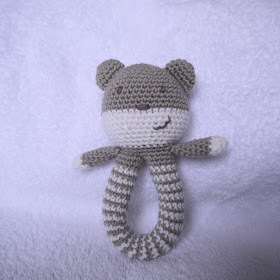 I loved do make this pattern, and I published in my blog, http://teiadecarinhos.blogspot.com.br/2014/05/meu-teddy-rattle.html. Take a look. I put a link to your blog. Thank you for spotting that. The increases are on row 10, but the spaces are actually more visible on row 9. I'll change the pattern to make it easier to understand. Hi, If you look carefully, you'll notice that the increases of rnd 10 are visible as three larger stitches on each side of the head. The stitches look larger because they have been used for the increases in the previous row. It's just a guide to find the sides of the head. Only sc are used throughout. Can you tell me the size of the finished rattle( lenght, width, circumference)? the photo makes it look rather small, and as I am making it, mine is looking much larger( my guage might be off) . Any help would be appreciated. Thanks! Hi the full length is approx 12 cm and the diametre of the head approx 5.5 cm. I hope this helps. My head got much longer than on the picture. I think it is depending on the yarn. I love this little rattle. Can I translate the pattern into Danish and publish it on my blog? I will refer to you, off course. Thank you for a great pattern! Mine is pink and moving to my little cousin. Quick question....after round 13 it says to continue sc until the middle of the increases in round 10. How many single crochets would that be (to the middle of the first set of increases -3 single crochets-; in between the two sets of increases -10 or 11 single crochets-; or in the middle of the second set of increases-24 single crochets-). Thank you for your help and your generosity sharing this pattern with all of us. Oh dear Melissa, I'll have to make another one to count the number of stitches! It is really just a guide so that the colour change is on the side of the head and so will be less noticeable. That's what I needed to know! Thanks again for this adorable pattern! I love the look of this-so cute! But I have one question, what is a 'magic ring'? Where do I get a rattle insert? is this pattern in US or UK terms. Hello,thanks for sharing this cute pattern, I really love it! There is a sentence in the article of rnd6- working through both thicknesses, 4 sc. May I know what the exactly means,please? Buy baby toys online that engages, entertains, and educates and get a lot more fun for your little ones. Hi. Just wanted to let you know that somebody is selling your free pattern on Etsy. I just wondered how many chain is a magic ring? Is this in Aussie or American terms? 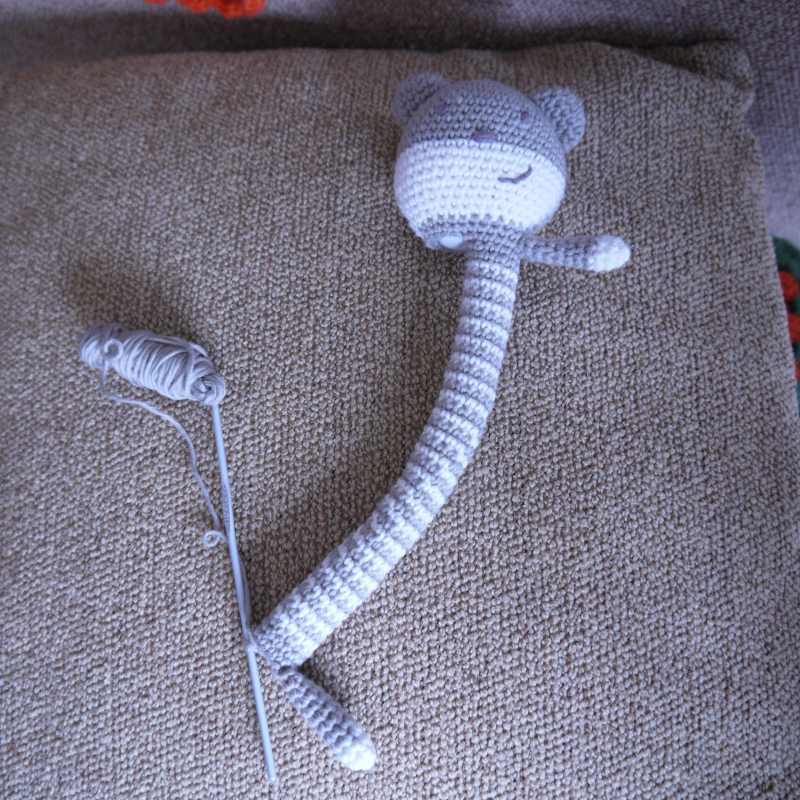 Hi and thanks for the pattern, I love it and am currently making one of these rattles for my nephew. I have a question regarding the arms, did you stuffed them? Im new to crochet and I just made this for my second project. Screwed it up a few times but I managed to work it out and pull it together nicely, little bit rough but the next one should be better. Thanks heaps for the pattern! I've made one for my little one. I love it. Thank you so much. Nice blog! great and practical idea.I found it very useful as i was looking for it. Hello and welcome to my blog. It's nice of you to pass by and if you feel like it, do leave me a little comment so this blog thingy can be a two-way communication, and I don't have the feeling that I'm blabbing on and nobody's listening. I try to juggle a full-time job in communications, living life to the full with my family and enjoying crafts and cooking in my free time. It's my sister Liz who taught me how to crochet when I was about 10 years old, and in March 2010, while recovering from surgery and thus with a bit more free time on my hands, I discovered amigurumi, Japanese for "crochet soft animals" and I've not stopped since! I also sew a bit, mostly making soft toys, which I offer as gifts to friends and family. My other interests are cooking, reading, learning, walking, crafting, and sharing my thoughts here on my blog.